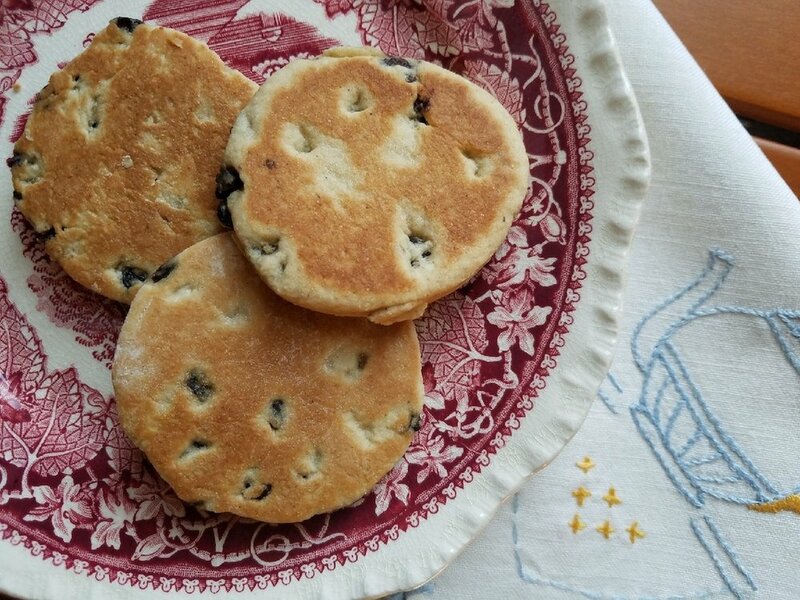 Welsh cakes are a delicious, not-too-sweet treat that are wonderful with hot tea or coffee. Sara’s great-great-grandfather George Lyons immigrated to the United States from Wales, and became a surveyor for a mining company in Barton in Western Maryland. Many of the miners in that area, mainly Barton and Lonaconing, came from Scotland and Wales and lived side by side in small communities, where their customs comingled, including a tradition called first footing. For New Year’s Eve, a house planned its first footing, or First-Foot, so that a tall, dark and handsome man bearing cakes or coins would be the first after midnight to walk through the door. Such a man planting a “first foot” in the house meant good luck for the year. There are several iterations of this tradition, depending on geography, or lore. But this is what Sara recalled from her family tradition. Sara’s great-grandfather’s brother, Jabez (pronounced Jah-bez in Western Maryland, unlike the town “Jay-bez” down around Lake Cumberland in Southern Kentucky), was a tall, dark-haired and very handsome man, and therefore much in demand for New Year’s. He would be hired out to walk through neighbors’ doors to provide the luck needed for the year. Sara’s grandfather Walter Lyons (see picture) also was called to fulfill the role. From left, Mabel Davis Lyons, daughter Mabel (Sara Gibbs' mother), and husband Walter Lyons. Because of his tall, dark and handsome good looks, Walter was invited to perform first footing duties. Shortly before midnight on New Year’s Eve everyone went home so that they would be inside before the New Year began. Only tall dark-haired men with money in their pockets were allowed to stay out past midnight. These lucky men were encouraged to enter every house in town where they were wined and dined with tables laden with pork and sauerkraut and enough alcoholic beverages to celebrate. Once the tall dark-haired man entered your house you could then go to other houses to celebrate "First Foot Night.” The first tall dark-haired handsome man to enter your home would have a lump of coal in his pocket or money and would place the coal in the fire for prosperity thru the year. An aside from Sara: Her nephew's wife said she was reading the new Nora Roberts book, Year One, and there is an important scene involving First Footing early in the book! We wish you the best of luck and happiness in the New Year! Sources: Sara Gibbs; journal by Mabel Lyons Thompson; Encyclopaedia Britannica; Historic UK; Mineral Daily News Tribune, Keyser, W.Va.